Abstract A Country Girl, a musical comedy in two acts presented by The Blenheim Amateur Operatic Society (Incorporated) at His Majesty's Theatre, Blenheim October 19 to 25, 1948. 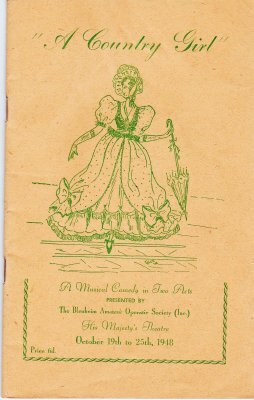 There are several copies of this programme, one is stamped P.O. Box 308 Blenheim, which will belong in this donation, but I have actually kept a cleaner version with no donor information on it (Jenny Pierson, 22 September 2012).